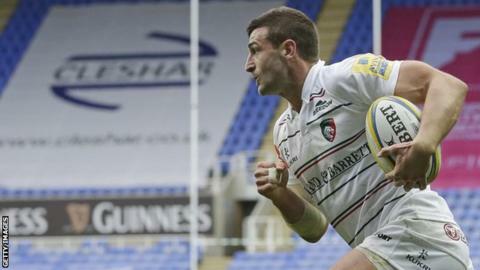 England wing Jonny May scored his sixth try in six matches as Leicester Tigers beat London Irish to register a fourth successive Premiership victory. Nick Malouf's early touchdown and three George Ford penalties put a dominant Tigers side 14-3 ahead at the break. Will Evans and Blair Cowan then traded further scores, before May continued his fine form since his summer arrival from Gloucester with another try. David Paice and Alex Lewington crossed to earn a losing bonus point for Irish. Despite their slender winning margin, Leicester, who were always ahead in the match after Malouf's third-minute try, were good value for their win and are now unbeaten since starting the season with two consecutive losses. May again impressed with a series of breaks and trademark winding runs, further strengthening his case to start England's first autumn international against Argentina on 11 November. Ford, captaining Tigers for the first time, also controlled the game from fly-half, particularly during a first half in which his three penalties put the visitors in the ascendency. Scores from Paice and then Lewington - from the last play of the game - did, at least, rescue a losing bonus point for the Exiles - their first point since beating Harlequins in the London Double Header on the opening weekend. "I'm pleased with the effort and the way we came back but again we gave ourselves a mountain to climb. "We could have three tries in the second half. When we had the ball we weren't clinical enough. "I knew it would be very hard but I didn't know it would play out like it has so far." "Jonny May is easily the best finisher and best left winger in England. I would certainly pick him but it's not my decision. "He's a threat, he's defensively good, he's committed and he finishes and creates opportunities. I think he'll be very close to Test selection. "The four points is important away from home. That's four on the bounce. which is a first time for a while." Replacements: Gleave, Elrington, Hoskins, Paulo, Lomidze, Steele, Brophy-Clews, Fowlie. Leicester: Tait; Malouf, Owen, Toomua, May; G Ford (captain), Harrison; Bateman, McGuigan, Cole, Tuohy, Barrow, Kalamafoni, Evans, Mapapalangi. Replacements: T Youngs, Genge, Cilliers, Wells, Hamilton, White, J Ford, Smith.